Once a week I will be updating my website so don't forget to check RAL NEWS and other pages and don't forget to come chat with us as we will be chatting in my chat room. Welcome to Ratsalot Rattery and Rescue(RAL). I am very new to the world of rats but I learn more and more everyday as I'm sure you do as well. I hope you find my information useful and website to be fun. I enjoy the company of sweet, loving and cuddly critters that most folks might find repulsive and gross but you know I feel sorry for them and pity those that have not yet experienced the love and joy that rats bring to one's life. 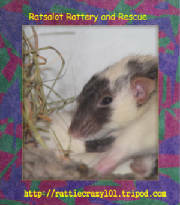 Please read about me, my ratties and my other critters. 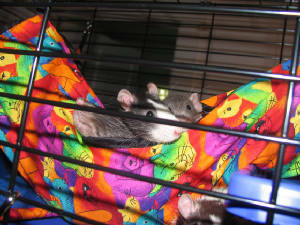 I am pleased to bring you sweet tempermanted adoreable rats into your lives and hearts from my rattery and rescue. Feel free to send me any comments, questions, complaints or just drop a line or two. I would love to hear from you and about your ratties or perhaps you would like to adopt some available ratties from my rattery and rescue. This is my new cage from Petsmart. I've had it for a couple of weeks but haven't updated any pics on it yet. It is a Multifloor ferret home. I have hammocks,suspended bed hideaway,a couch and it has some tubes. I also have a rollahay ball inside as my girls love sweet timothy hay. I found the boys didn't care for it much. They'd sleep on it but the girls munch away. Given in small portions it adds fiber to their diet. I have three plastic crocks that attach to the side of the cage. Two large ones for food and one for treats. They really love their new cage. I did find however and new it to be fact that the bars are too far apart for squishy little nosey ratties and my observations were correct. Lilly and Isabella my two "trouble makers" squish out and explore. 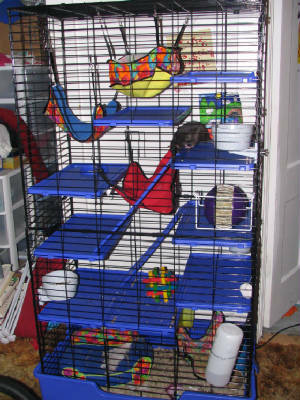 I have a boys' cage that is similar but smaller with a ferrettrail tube on top. The results the same. WE reenforced the cage with some wire from Home Depot. Worked like a charm. I haven't had much time to do so to the "BIG" cage so when I do then more ratties can live in luxury. 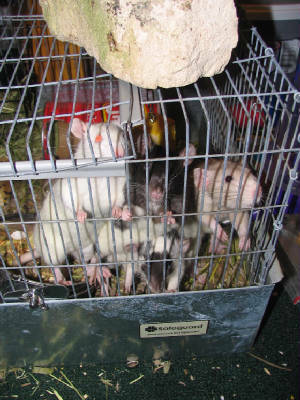 But for now only three ratties cohabit this cage. It can hold up to 10-12 ratties with comfort and room. 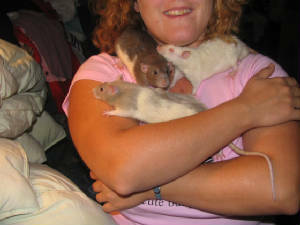 Anyone order armful of ratties? Do you come home to this? Who said THREE's a crowd? Please sign my guestbook and let me know how I'm doing or anything else you'd like to add. It would be greatly appreciated to have feedback. Please feel free to use this banner to link to my site from yours. I'd appreciate the visitors. Don't forget if you do link to my site and if I don't have your site on mine already do email me any banners or links you'd like me to use. I thank you for doing so.